Handle: Kraftform with non-roll feature, multi-component. The Kraftform handle ensures rapid hand repositioning without any danger of the skin sticking to the handle. Kraftform Plus screwdrivers enable a higher transfer of force with less effort and relieve the entire hand-arm system. The outstanding design of the Kraftform handle fits perfectly into the hand. Kraftform Plus screwdrivers are the ideal choice for manual screwdriving jobs. Wera Lasertip reduces the contact pressure required and enhances force transfer. The 05028038001 Wera Kraftform Plus 367 Torx Plus Screwdriver is one of thousands of quality tooling products available from MRO Tools. Please browse Wera 300 Series Kraftform Plus Torx Plus Screwdrivers for tools similar to the 05028038001 Wera Kraftform Plus 367 Torx Plus Screwdriver. 05028038001 Wera Kraftform Plus 367 Torx Plus Screwdriver description summary: Wera Kraftform Plus 367 Torx Plus Screwdriver. 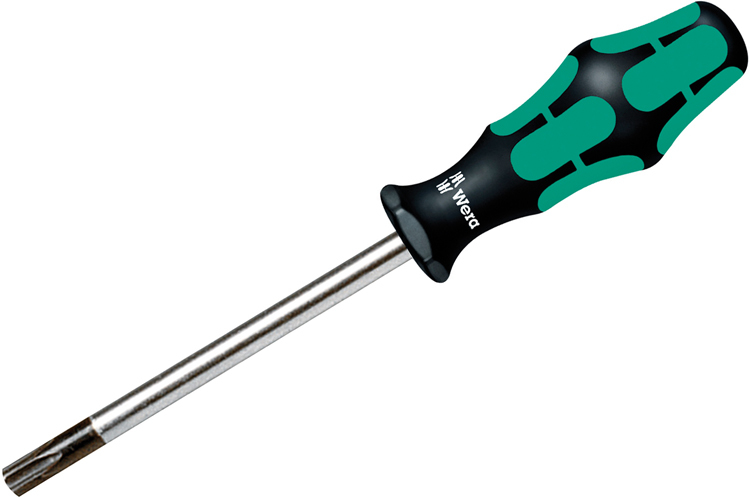 Point Size: 30 IP Shank Overall Length: 115mm / 4 9/16'' Handle Overall Length: 105mm Shank Diameter: 6.0mm Quantity discounts may be available for the 05028038001 Wera Kraftform Plus 367 Torx Plus Screwdriver. Please contact MRO Tools for details.